The World Apostolate of Fatima (WAF), is an association present in many countries throughout the world which is open to all the baptized. It is directed primarily although not exclusively to the laity. It seeks to make known and lived the message of peace and salvation for all mankind given by Our Lady of Fatima. On 7 October 2010 it was permanently erected as a Public Association of the Faithful by Cardinal Rylko, President of the Pontifical Council for the Laity. The WAF arose in 1947 in the United States, through the joint initiative of Fr Harold Colgan and John Haffert. It was originally called the Blue Army and rapidly spread all over the world with millions of members and national centres in various countries. In the 1980s its name was changed to the World Apostolate of Fatima, since this more correctly reflects its universal character and purpose. Its international headquarters are in Fatima, in the beautiful pilgrim guests’ house, Domus Pacis (“House of Peace”). In 2004, there were over 50 nations in which the Bishops’ Conference or one or more Bishops had recognised the Apostolate, and some 50 more where the Apostolate was commencing with individual members and prayer cells. The general purpose of the World Apostolate of Fatima is to promote the authentic teaching of the Catholic Church, strict adherence to the tenets of the Gospel, and the personal sanctification of its members through faithful compliance with Our Lady’s message at Fatima. The WAF invites the faithful to accept Our Lady’s requests for prayer, penance, the offering of sacrifices—particularly those encountered in fulfilling the duties of one’s state in life—daily recitation of the Rosary, and the Eucharistic reparation of the Five First Saturdays. The WAF is self-governing in each country, and seeks to promote the true understanding and acceptance of Our Lady’s message, in a spirit of fidelity to the commandments of God and obedience to the Church. It always operates only with the approval of the Bishop’s Conference or the local Ordinary, and the permission of the parish priest. A Public International Association of the Christian faithful is an association of people erected by the Holy See, which alone can receive a mission to teach Christian doctrine in the name of the Church, promote public worship or pursue a purpose which by nature is reserved to ecclesiastical authority (canon 301 §1). Public associations are able on their own initiative to undertake endeavours in keeping with their own character and according to their statutes, under the higher direction of the competent ecclesiastical authority. As a public association, the members act in the name of the Church when fulfilling the purpose of the association, and they commit themselves to become faithful witnesses of the Catholic faith in their families, at work, in their parishes and communities, participating in this way in the “New Evangelisation”. Vatican Council II, and later post-conciliar teaching, has given special attention to the new forms of association of the Christian faithful and their participation in the life of the Church. In his Apostolic letter,Novo millennio ineunte, Blessed John Paul II wrote about the great importance of “the promotion of forms of associations, whether of the more traditional kind or the newer ecclesial movements, which continue to give the Church a vitality that is God’s gift and a true “Springtime of the Spirit” (46). “To know the message is to know the Gospel, to live the message is to live the Gospel. To accept the Message is to accept Revelation as interpreted by the authentic Magisterium of the Church. There is almost no article of the Faith of the Church which is not reaffirmed, explicitly or implicitly, in the message ofFatima, understanding this in its widest and deepest sense”. (From Bishop Amaral’s Prologue, dated 13 August 1991, to the work by Fr Fernando Leite, SJ, Francisco of Fatima, p. 5). 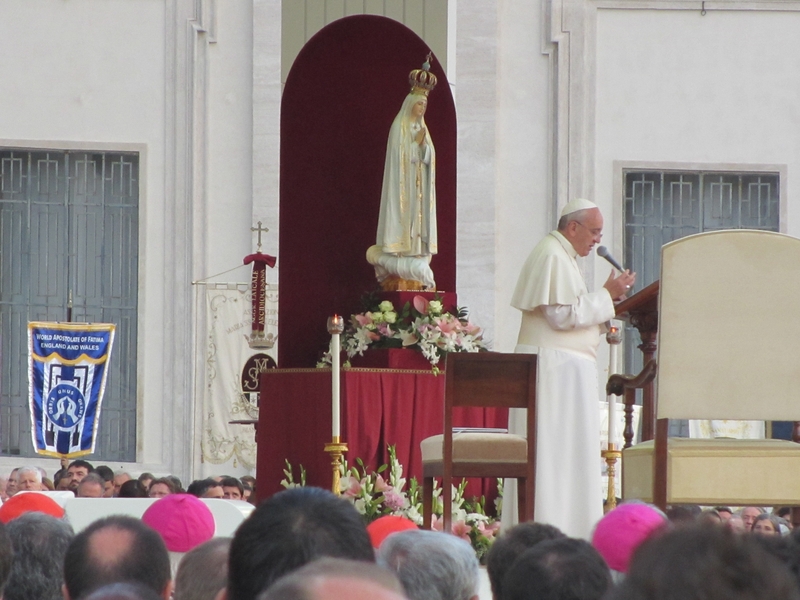 “In the light of a Mother’s love we understand the whole message of the Lady of Fatima … who desires everyone’s salvation and cannot keep silence on what undermines it. “The Lady of the message seems to have read with special insight the ‘signs of the times’, the signs of our times. “In the very heart of the message that came from Fatima we find a powerful warning about errors based on the denial of God and the attempt to cut off mankind completely from him” (on returning to Rome from Fatima, 24 May 1982). “The message is the true Gospel of Christ. It still retains all its timeliness today (our emphasis). Let us receive the light that comes from Fatima, let us be guided by Mary.” (On returning to Rome after the beatification of Francisco and Jacinta at Fatima, 13 May 2000).